All cats should be desexed. 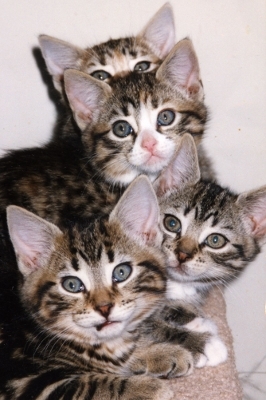 More kittens are born that there are good homes that can adequately provide for their needs. 'Cat toilets' should be provided outside as well as inside to prevent cats using neighbours' gardens. If you feed a cat you must provide soft, freshly-turned earth, sand, leaves or suitable litter for the 'consequences'. Cats require a natural, satisfying diet of raw meat with canned food and vegetables added. Well fed cats are more contented, stay closer to home and are less likely to hunt. They are also less likely to get sick. We never feed dry food. Cats are intelligent, like fresh and exciting things to do and hate being confined for long. If the best you can offer a cat is a life of confinement in an enclosure, cat-run or house, then don't get one. Cats need to be kept free from fleas, worms, ear-mites and other parasites. Free ranging cats are less likely to have problems but cats with small territories need extra care. Short haired cats can usually groom themselves but before purchasing cats with long hair, consider the time and effort required to maintain their coat. If you feed strays, make sure you get them desexed. C.A.T.S. can help. Don't get a cat from another area. Choose a stray or kitten already in your district. Bringing new cats into the suburb increases the ratio of cats per area – something we don't need. Unless moved, cats rarely get lost. When moving cats, keep them inside for a month before you let them out, or they may try to go back to their old home. Many cats don't wear collars as they can be caught up or hanged, so finding cats without collars doesn't mean they aren't owned. If you see healthy cats, leave them alone, as the majority of cats taken to shelters are killed. Cats should not be transported loose in cars. Try to get a carry cage. Cat bells do not help wildlife because when cats stalk prey they do not ring the bells. Bells are detrimental to the safety of your cat so never use them. Ringing cat bells can make it easier for dogs and those who are not so keen on felines to locate the wearer. The cat's acute hearing of approaching danger is also restricted by bells. Cats are little beings with feelings and needs, just like us. They are not to be treated as inanimate objects and should never be given as presents. If you cannot adequately provide for the needs of a cat, then don't get one.